Many shrubs will stop growing or will not grow in the desired shape if they are incorrectly pruned because their new growth only begins in well-defined areas of each branch. Yews are different. Yews contain new branching nodes all along the length of each branch, so virtually no matter where you cut a yew bush, new growth will still sprout. This allows you to trim your yew for shape and size with little concern for removing too much of a branch or whether you are removing old or new wood. Trim yews most heavily in early spring before new growth begins. Yews can withstand heavy pruning, even back into old wood. Start by cutting any dead or broken branches all the way back to the point where they connect to a main branch or the trunk. 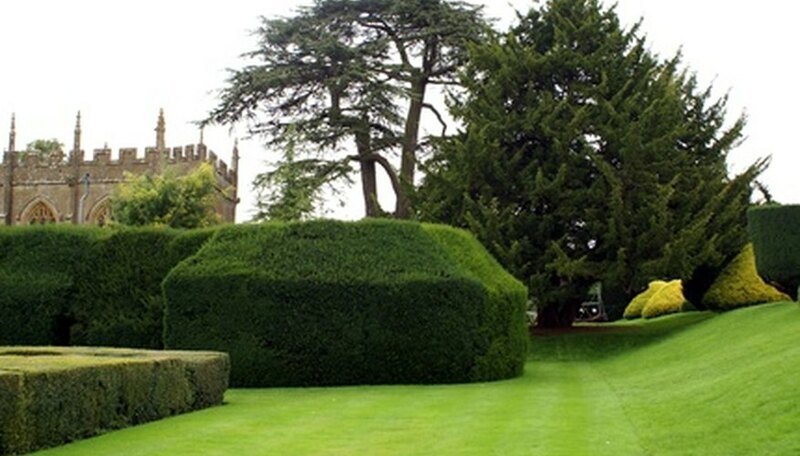 Step back and decide how tall you want your yew bush and what shape you wish it to be. Use your loppers, saw and or garden trimmers to cut your yew to the size and shape you want it. Discard all cut branches. Continue making small cuts to your yew as summer progresses in order to maintain the shape you want. Yews can be trimmed all year long for shape and height. Yews are one of the most forgiving of all shrubs when it comes to pruning or trimming. At the end of fall or in early spring yew shrubs can be trimmed back to 12 to 18 inches high and still come back strong in spring and summer, filling in virtually all trimmed areas.